Apologies for the delay in posting this. I’ve had some problems with my DVD playing software that are now, hopefully, resolved. The goal of this episode seems to be to introduce two of the series’ main characters: Bolin and Mako, the probending brothers that make up two thirds of the Fire Ferrets. 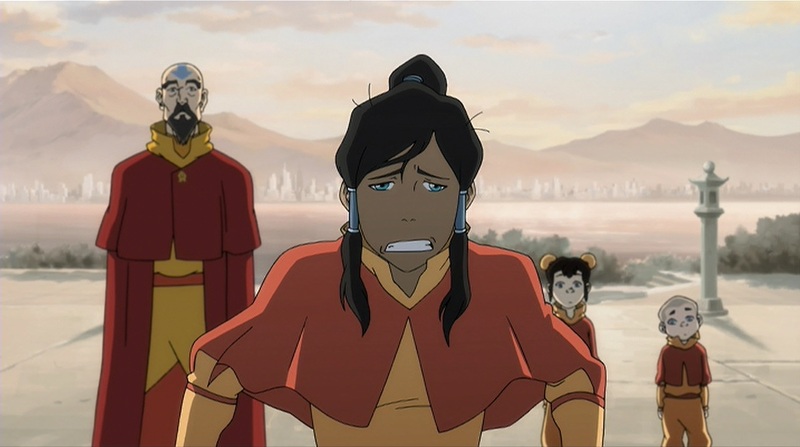 This has been done with a self-contained episode that doesn’t mention the main conflict in the show – Amon and the Equalists – but it does feature prominently Korra’s core personal conflict, her difficulty in learning airbending, and another major theme, Korra in conflict with a figure of authority. Using these conflicts in a scaled-down version of the overall series is an effective way to establish them and their importance in Korra’s story. It’s a well-structured episode too. 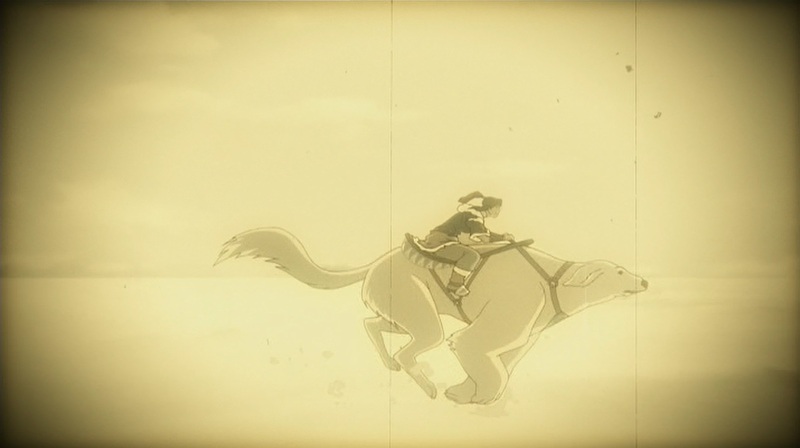 It opens with a reminder of the first episode, narrated by the same voice actor as the probending announcer, with the visuals in sepia tone with visual artefacts to give it a feeling of being old, a nice little nod to the time setting of the series, an industrial, almost modern world. All images copyright Nickelodeon. Used under fair use for review purposes. 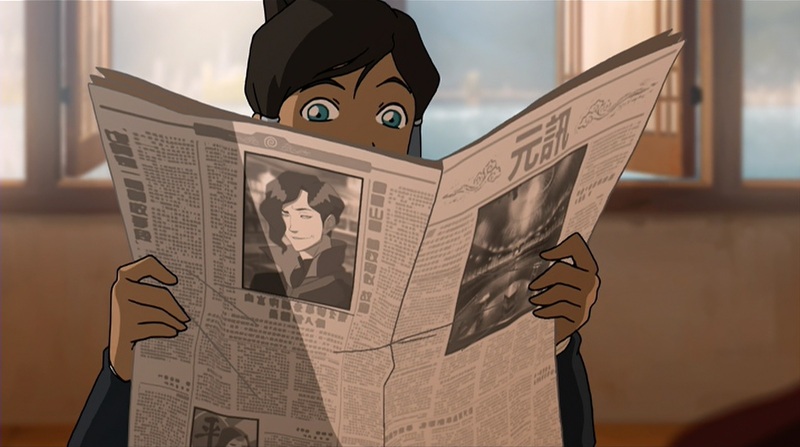 The episode proper opens with Korra reading about probending from the newspaper, and Tenzin complaining about probending. So straight away we get to the main conflict of the episode: between the exciting, fast-paced, modern probending, and the spiritual, traditional techniques Tenzin relies upon when teaching airbending. It’s about new versus old, instant gratification vs dedicated study – and it’s obvious which one of these the hot-headed, impatient, excitable Korra is going to prefer. This is a pretty effective shot too: we see Tahno, the leader of the Wolfbats probending team, on the back over, as well as a cut-off picture of Amon, the episode’s sole reminder of the main conflict. Forbidden from watching a match, Korra instead begins her airbending training. This starts with a traditional training tool comprised of spinning gates, requiring graceful movements, careful timing and planning ahead. Korra sees it instead as a test of speed and agility, both of which she possesses, and she finds herself battered by the gates. Six seconds later, not so much. 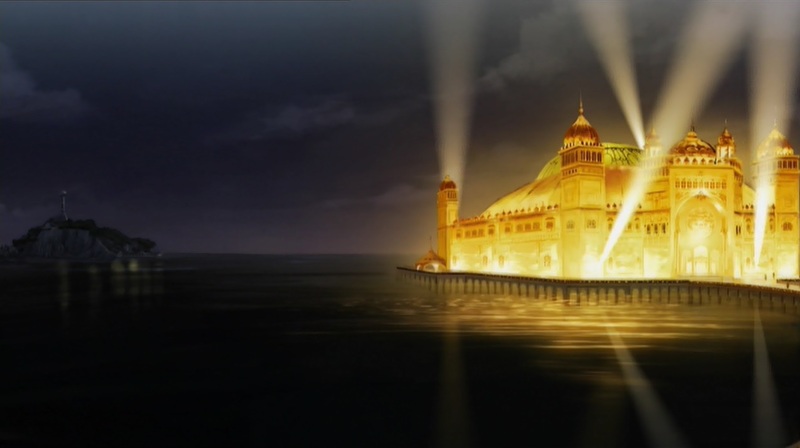 With Korra therefore at a low ebb, the radio commentary of the Fire Ferrets’ match in the probending arena takes on an attractive sheen; and when Korra later sneaks off at night to watch a match, the arena is shown to be a shining golden beacon, all lit up in stark contrast to the sombre Air Temple Island. Bolin is introduced first. He saunters up and helps her get away with sneaking into the arena, all smooth moves and excitable friendliness. 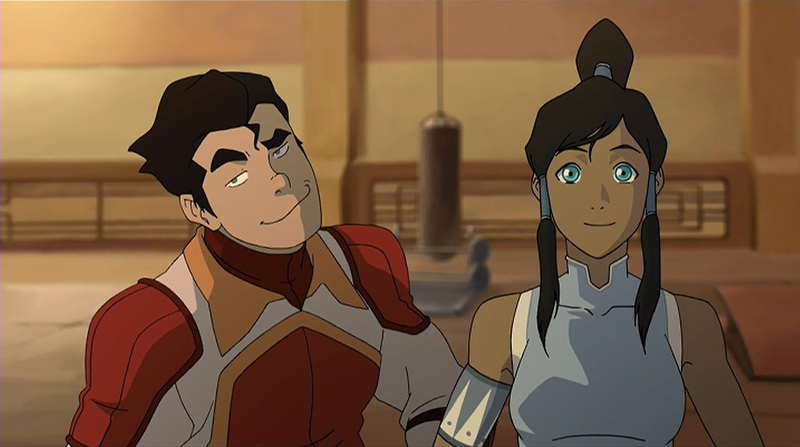 The introduction to Mako is less friendly; he practically ignores her, and it’s not until after the match when Korra reveals she’s the avatar does he feel like she deserves his attention – which I feel makes him come across as a right jerk, if he’d act like that around any other person Bolin brought to watch a match rather than try to be nice, or at least polite. The Fire Ferrets win their match, but the tone isn’t one of celebration. Mako and Asuk argue over Asuk’s poor performance, and he storms off. The writers here have laid the groundwork for his later abandonment of the team, opening a space for Korra. Bolin’s above all this, though, and eager to make friends with Korra, he offers to show her some moves. 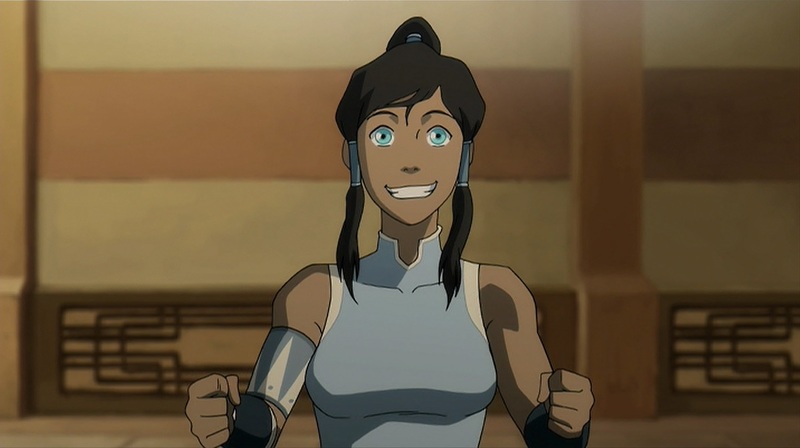 After establishing that she can earthbend and is in fact the Avatar, Korra and the brothers migrate to the training gym, where Korra finds instant success in learning probending moves from Bolin – but a good cut nicely juxtaposes that success against her failures in her airbending training. … but airbending failure. Notice the contrast in light sources: the light is on Korra’s face before the cut, but coming from behind her after. So it’s no wonder she returns to the arena, and when Asuk fails to show, joins the Fire Ferrets team. 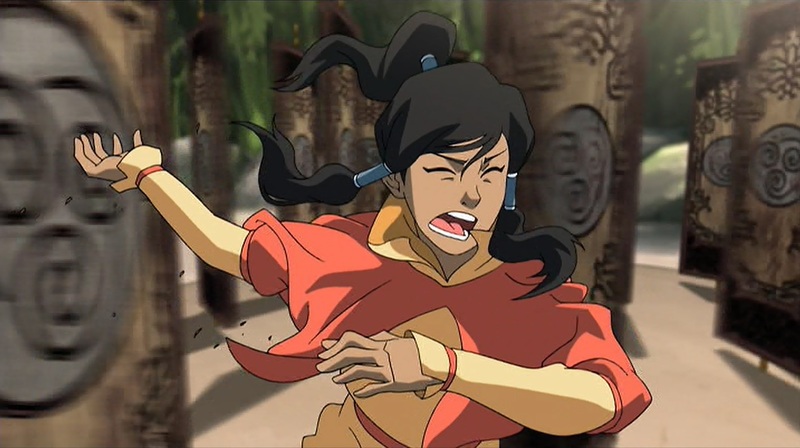 And here we see a different contrast: the traditional techniques Korra is familiar with are no good in a probending match, and combined with her ignorance of the rules puts her in a weak position and she is knocked out of the arena. And at the edge of the water, Tenzin is waiting, angry at her for disobeying his orders to stay on the island and determined to respond by placing even more restrictions on Korra, which of course she does not respond well to. Yet it is Tenzin’s training that helps her here: the graceful, well-timed movements that the airgate exercise requires help her to avoid the other team’s attacks. 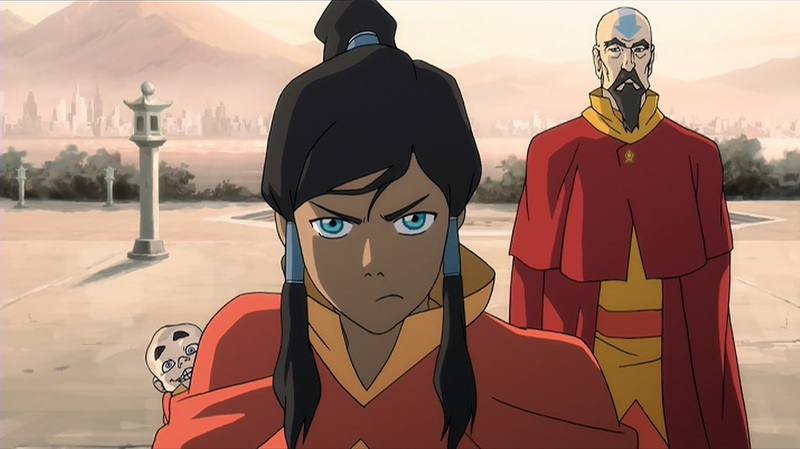 The two disciplines – traditional and probending – don’t need to be in conflict, but could work in tandem to make Korra a better bender overall. Korra gains motivation to rededicate herself to airbending training – where she was so willing to give up before – because it can help her achieve what she wants in the probending arena.